All that you need to know to find the perfect bass guitar neck for you. Whether you're just starting out as a bassist or have been playing for years, you have to respect the neck of the bass guitar. The right bass neck fits you like a glove and is effortless to play, while the wrong one can hamper your playing and potentially damage your body (carpel tunnel syndrome anyone?). This is especially true if you have small hands or are migrating from playing guitar or mandolin; in comparison the bass guitar neck is larger and more intimidating. A brief history lesson: in the beginning there was Leo Fender and he created the first mass-produced electric bass - the Fender Precision bass (or P-bass). A few years later Mr. Fender unleashed the Fender Jazz bass (or J-bass) on the world, the notable differences being two pickups (in place of the single split pickup on the P-bass) and a thinner neck. These two basses by Fender can be traced back as the common ancestor for just about every bass that's currently on the market. Since no single neck is perfect for everyone, both thin and thick necks are prevalent on bass guitars today. Some prefer the speed of a thin neck, while others find them too small for their liking. 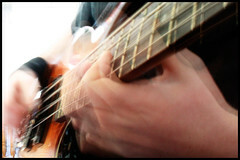 Some feel that a thicker bass guitar neck has a better sound, and that it forces them to slow down and pay more attention to their note choices. Others toggle between both; Jaco Pastorius was known for having a P-bass neck on a J-bass body for his practice bass, then whenever he performed with his J-bass live, he played that much more effortlessly due to the thinner neck. If that wasn't enough there are also set neck, bolt on necks and neck through style bass guitars (also known as thru neck bass necks) along with at least a half dozen different bass guitar neck fingerboards to choose from. Choosing an electric bass neck comes down to one key concept: play every kind of bass guitar out there and see what feels best to you. It doesn't matter who your particular bass hero is and what they endorse, your hands are unique and everyone has different tastes. I recommend auditioning any bass, regardless of price and turn off your eyes! Colour, make or model of the bass is unimportant at this stage, it's all about feel and playability. A great place to start is with Fender basses, try out Precision bass necks and Jazz bass necks and see which one feels more comfortable to you. Even if a Fender bass neck isn't your 'style', knowing whether you prefer a J-bass neck or a P-bass neck, or somewhere in-between will help you communicate what you're looking for to others. An understanding of Fender bass necks will give you a frame of reference that a good sales person can understand. Is the bass comfortable to play in the first position? (1st to 4th fret across all strings). This is where the 'money notes' are for bassists; the lowest notes on the bass guitar are here and chances are that you'll be playing them often. The frets are furthest apart and the neck is deepest or thickest in the first position, so if it feels uncomfortable - beware! Is the neck well balanced or is it prone to neck dive? If the neck plunges to the floor when you remove your hand from the neck – you’ve got bass guitar neck dive baby. A bass that balances will require less effort to play. Does the neck fit or fight your hand? Muscle fatigue is a sign that you may be 'fighting' the neck instead of it fitting you. You may need to adjust your technique or strengthen your hand. If you experience the dreaded 'pins and needles' sensation in your fretting hand, wrist or fingers - stop right away, something is seriously wrong! Can you easily access the upper frets of the highest string? Depending on the style of music you play, this may be a completely moot point. However, a well designed/playable bass should allow access to all the frets on the neck - what good is it to have a 24 fret neck with only 21 that can be played? Back when I was in high school, I signed up for the music program already knowing that I wanted to play bass; nobody else competed with me in the class, but I still remember having to show the teacher the size of my hands before I was ‘allowed’ to play the instrument. As bassists already know, necks for bass guitars are much wider than for guitars. Luckily, I'm tall and have ‘piano fingers’ and got the nod, but I was determined to play the electric bass regardless of whether my teacher offered his consent. I didn’t have any problems with the bass guitar neck on the first five basses that I owned; most of these were four string basses. However, even my ‘piano fingers’ were tested when I purchased an Ibanez BTB 505 5 string bass. This bass had a wider neck in comparison to my Ibanez Soundgear 1205 (a 5 string thin neck bass). I knew the neck was wider on the BTB, but I didn’t think it would be that big of a deal – I was wrong. I developed what I believe to be a ‘calcium deposit’ just under the skin at the base of my thumb on my fretting hand; basically it was a large and hard bump that hurt if I pressed on it firmly. I caused this with the tendency to "strangle" the neck of the Ibanez BTB bass while performing, which also caused an ache in my thumb. Stubbornly, I ignored the warning signs and played through it. It wasn’t until my Ibanez BTB was being repaired that I noticed how much easier the Soundgear neck was to play. Sure enough, without playing the Ibanez BTB for a while, the calcium deposit and the aches went away and my hand is back to normal. The neck that fits me best seems to be somewhere in between those two necks; the Ibanez Soundgear neck was a little too narrow, and the BTB was a little too wide – my F Bass BN5 neck is perfect. The moral of the story is this – listen to your body, and adapt the way you play. You don’t have to have small hands to have problems playing the bass, especially if you opt for five or more strings. Just make sure to watch your technique and exercise patience while adapting to a bass guitar necks. Those of you that are certain that playing bass is for you but are still having difficulties may want to check out some custom builders that specialize in small scale electric basses. These are basses with smaller bodies and shorter necks that still sound like an electric bass guitar should. They may cost a little extra, but you’ll appreciate it every time you reach for a bass that is perfect for you. Can't Afford to switch basses? Some of you may think that trying out various bass necks is great if you're planning to buy a bass, but what if you can't afford to? There are some options that can make living with your 'less than perfect bass neck' a little easier. Sometimes throwing money at the problem isn't the solution (sales people will rarely admit this); you may need to play that neck and just get used to it. While some are easier to play than others, there isn't a single bass guitar neck that truly plays itself - you have to play what you have and get good with it. Practice and watch your technique; make sure the wrist on your fretting hand isn't bent at an extreme angle, and use as light a touch as possible (without fret buzz) to avoid injuries. Keep at it and remember that practice makes perfect. An option for reducing the size of a neck that is too thick is to modify your bass guitar by shaving it down. This is tricky work and not an exact science, so don't attempt to do it yourself. A good tech or local luthier may agree to do this for you; it'll cost you either a flat fee or an hourly rate depending on how much you want wood you want to remove. There are some aftermarket parts companies that specialize in replacement bass necks. Allparts and Warmoth are two companies that do make them but most of their stock is for a Fender style replacement bass neck. To get a custom neck built by a luthier or tech may run you from $700 and up - depending on the cost of your bass, you may just want to buy a new one instead; handmade necks for a bass guitar aren't cheap! Now you know how to find perfect bass guitar necks for you whether it's a thru neck bass, or thin neck bass guitar - as long as it doesn't have bass neck dive you're good to go. Thanks for visiting Bass Guitar Rocks.com! Actually the widest part of the neck is at the heel. The NARROWEST is at the first position. Unless of course you mean the thickest part of the neck. Thick and wide are two different things when you're talking about necks my friend. Thanks for the catch, I realize now when I wrote that bit that I was thinking more about the thickness or depth of the neck rather than the width. 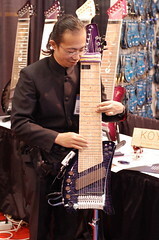 You're right, the neck widens out as you decend towards the body and also flattens out, whereas in the first position, the bass guitar neck is thinner and thicker or deeper. I hope that makes sense? I'm going to edit the page to reflect this change. Thanks again! I have a soft spot for Ibanez basses as well - my first "real" bass was an Ibanez X Series 4 string that was gloss black with a rosewood fingerboard. It looked a lot like an explorer. Metallica was huge at the time so I felt really cool playing it. My first 5 string bass was also an Ibanez - a Soundgear 1205. The fast and smooth thin bass neck made transitioning to a 5 string as easy as possible... I just had to get used to playing the E on the second string down instead of the top! Thanks for the comment, cool site you got there! I've been playing a long time and this is really a well-written article. Your recommendation regarding first position as well as suggesting that one forget about what his hero plays when deciding are both right on. Much of the world play P & J basses on image alone. (Of course, they have "the" sound and are good basses, but neither is remarkably comfortable. I own them, but my Ibanez and Music Man Sterlings are 100x more comfortable to play.) Well done. Thanks for the comment Rick. I preferred Ibanez bass necks to Fender bass necks in the beginning as well, and I haven't had the pleasure of playing a Music Man Sterling bass neck (yet). I hope everyone tries out plenty of basses to find the one that fits them best rather than going by looks alone! Choosing a bass guitar neck can be difficult if you don't play various types. Narrow isn't always the best thing depending on your playing style. Sometimes a neck that i rather wide ant the nut still plays easily if the neck profile is good. Lakland basses have some of the best necks I've played. They are wide for some players, but the neck is a compound radius that gets thinner (front to back) as you move up the neck, making it very comfortable. If you play with a pick, you may like narrower necks. If you play fingerstyle, you may like a wider neck that provides more finger room for your right hand where the strings cross the pickups. There's no "right" choice -- whatever works for you and allows you to play without discomfort. It sounds like you should be playing a bass that's smaller; if it feels too heavy and his hard for you to play in the first position you're going to have a hard time trying to learn the instrument. The Ibanez Soundgear basses are well known for having thinner necks, you can check those out. Fender Jazz basses (Squire Jazz basses too) have thinner necks, but you may also want to check out 3/4 sized basses with a 30" scale (short scale) instead of a full sized bass. The Fender Mustang bass, Fender Bronco Bass and Flea Bass Junior are the short scale basses that come to mind. Best of luck finding the bass that's right for you Jewell! hi, I am also a woman with small hands starting out and have a similar question... I live abroad and there aren't endless options to play at the music store in order to find what is comfortable. I tried the Fender Jazz, like that a lot, but its out of my price range. Been looking at guitars on line and wanted to ask you this: between a MMstingray, MMSub, or lakland Skyline 44-01 - do you know which bass has a comfortable neck (like the fender) and weight? I'd love to help you out, but it would be impossible for me to make a recommendation. I've haven't played all of the basses you mentioned, and the last time I touched a Music Man Stingray was probably close to 10 years ago. Is it possible to reach out to other bass players in your city and possibly swap basses? I know a lot of online retailers like Amazon let you return a purchase if it's not right for you - but since you said you're from 'abroad' I'm not sure how viable that idea is for you. Don't give up - where there's a will, there's a way. Finding the right neck is a very personal decision and bass guitar necks can vary from brand to brand, model to model and from year to year, which is why I stand behind playing a bass neck before you make the commitment. Good luck! Hi Michael, thanks for this article. 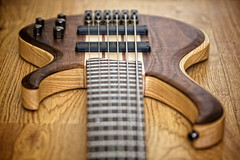 Can you please tell orrecommned a source to learn about how to choose the wood for the costum made bass? For example - what's the advanages of the woods like: Wenge, Rosewood, Ovangkol, Maple? I appreciate the comment. I don't have a 'definitive' source for learning more about the benefits of many tone woods. I do have a copy of a Bass Player magazine from the mid 1990's that had a cover story on tone and if memory serves - Michael Tobias was considered one of the foremost experts on the subject. I'll see if I can dig it up. Aside from that - most bass builders have a wealth of information that can help you to make your decision. For instance, George Furlanetto has a basic recipe of woods that he likes to work with (ash and maple) for his F Bass BN5 series of basses and he states the benefits of the woods separately and in unison as an instrument. So if you're looking to have a bass built and you have a certain sound in mind and a certain builder in mind - you can ask them questions directly or see if they share more information on their website. Hopefully that helps you out while I research a more 'definitive source' for answers to your tone wood questions. but now I'm trying to put together a Fender Jazz with a skinny neck, so I can play some solo type stuff. All I have been able to find on eBay is C radius necks, except for one from Japan which was an A neck, but I lost the bid. Can you help me locate a skinny A or B neck that will fit on a Jazz body ? I'd love to help you out - but I don't have any special connections for helping you chase down a skinny A or B neck that will fit on a Jazz body. However, if anyone from the Bass Guitar Rocks community reading this can lend a hand out to Tony, please leave a comment here as well. Also - I removed your phone number to protect you from potential spammy sales calls. I wish you the best of luck on your search for a skinny Jazz bass neck. Check back and let us know when you find your holy grail!